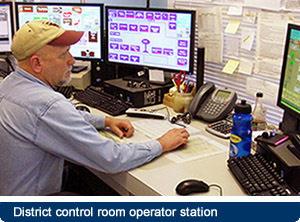 At the back of the Water District’s operations building is a control room with eight computer screens surrounding an operator station. 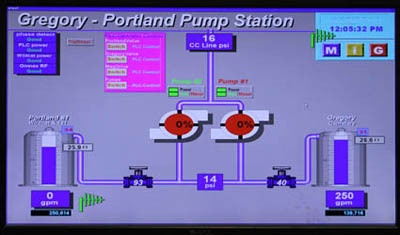 From this spot the operator can monitor valves, pumps, chemical feeds, filters, power consumption and pressure levels throughout the District’s three water treatment plants. He can turn on pumps at the Edwards Pump Station 26 miles away at the Nueces River or adjust a valve on the line delivering water from Lake Texana. He can also see the current status of line pressure, valves, pumps and tank levels in Odem, Taft, Portland, Gregory, Ingleside, Aransas Pass and Rockport. He can reset or override pre-programmed settings to maximize system efficiency. This is possible because of a sophisticated system of remote sensors and controllers that communicate with the control room either through a set of radio connections or via fiber optics. These systems are typically referred to as SCADA – short for supervisory control and data acquisition. 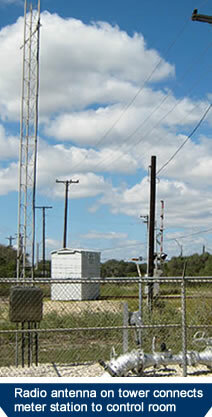 SCADA systems are used to monitor and control continuous processes at utility providers and in industrial settings. The Water District sells water to customer cities as a wholesale provider. Each city owns and operates its own public water system and is responsible for providing water to homes and businesses. MUNICIPAL CUSTOMERS - On a voluntary basis five of our customer cities have elected to contract with the District to provide them with technical support and SCADA monitoring services that take advantage of our round-the-clock control center. That means that if a pump stops working in one of these towns or a tank level drops rapidly (suggesting a major line break), the Water District operator can alert city water department personnel to respond to the situation. While the District provides monitoring services, it is not responsible for the operation of these local public water systems. The District staff provides technical expertise and acts as instructed by the customer cities. These services are provided at cost. The Water District has been in the remote monitoring business since the 1960s when phone lines were first used for telemetering at city master meters and at the then-new Edwards Pump Station on the Nueces River at Calallen. In the 1990s the District concluded that using smart technology systems would be the most cost effective way to continue providing customers with reliable water service. The result was installation of the radio signal based SCADA system which allows monitoring of the entire system of raw water delivery, treatment, storage, pumping and water transmission to customer tanks..
As part of the District’s major expansion being completed in 2011 this system is being supplemented with fiber optic communication in some areas. This move will make the overall system more storm resistant. Today about one-third of the District’s total staff works as part of the technical team responsible for SCADA system design, equipment selection, installation, programming, upgrades and maintenance. COMPATIBLE SYSTEMS - Over the years customer cities have installed instrumentation and controls in their water systems that allow monitoring of tank levels, pumps and line pressure. Through cooperative effort all of this equipment is standardized for maximum compatibility and integration into the overall monitoring system. At the delivery point for each municipal customer the District maintains a meter, a pressure gauge and a motor controlled choke valve. While these are monitored and controlled from the control room, each component is independently computer controlled and will continue to operate following pre-programmed instructions even if radio or fiber optic communications are lost. The Water District does not deliver water to municipal customers under pressure. 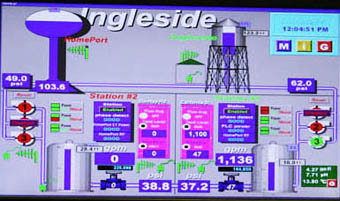 As can be seen in the Odem monitoring screen, water is delivered through a check valve into a top inlet of the city’s ground storage tanks. This prevents backflow into the District’s transmission line. It also allows the District to make more efficient use of pumps, electric power and transmission line capacity by delivering water at the District’s discretion to different cities at different times as needed to maintain the desired reserve level in their local storage tanks. An important benefit of the overall monitoring and control system is that it allows the District to minimize electric power costs by limiting what equipment is running at any given time and by having the ability to turn equipment off during periods of peak power demand.